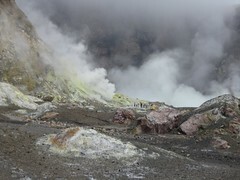 The most volcanically active place in NZ (although not ranked highest in terms of risk as nobody lives there) is a fascinating day trip from Whakatane, Bay Of Plenty. I think you need to have more information on this page like what kind of volcano it is, last eruption, how big it is, what plate it is on stuff like that. I dont say this in a mean way it’s just that im doing Research and well this site didnt help as much but THANKS ALOT.